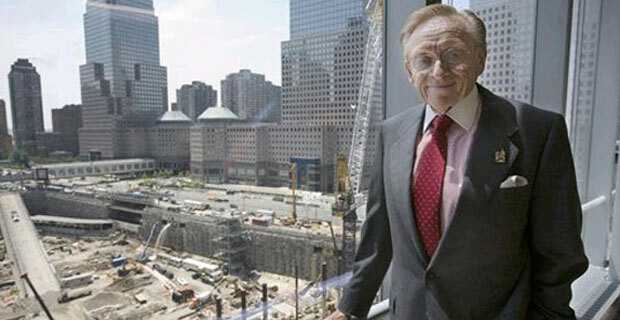 Governor David Paterson and Mayor Michael Bloomberg may direct tens of millions of dollars in unused incentives to World Trade Center site developer Larry Silverstein, who held the lease on the Twin Towers when they collapsed and who holds the rights to build three large office buildings on the site. The Wall Street Journal reports that the funds would be directed towards the office space being erected at the former site of the Towers. Silverstein has already been the recipient of a string of financial incentives. Reports indicate that Silverstein has received public subsidies via low-cost financing and direct aid to the tune of $1.2 billion dollars. What do you think about building office space at the former site of the Twin Towers? Given how they’ve been jerking Larry around for all these years, plus the incredible delays and stupidity we’ve endured during the reconstruction, this would be a drop in the bucket.